A SOLDIER'S JOURNEY balances a range of opposing feelings and actions in the same epic composition. It reflects both what is civilized and what is savage about humanity in a story that explains The Great War. 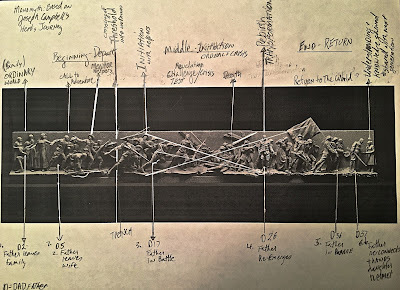 The ideals of heroism, family, and caring are juxtapositioned with the violence, terror, and aggression of battle in the WW1 relief sculpture. 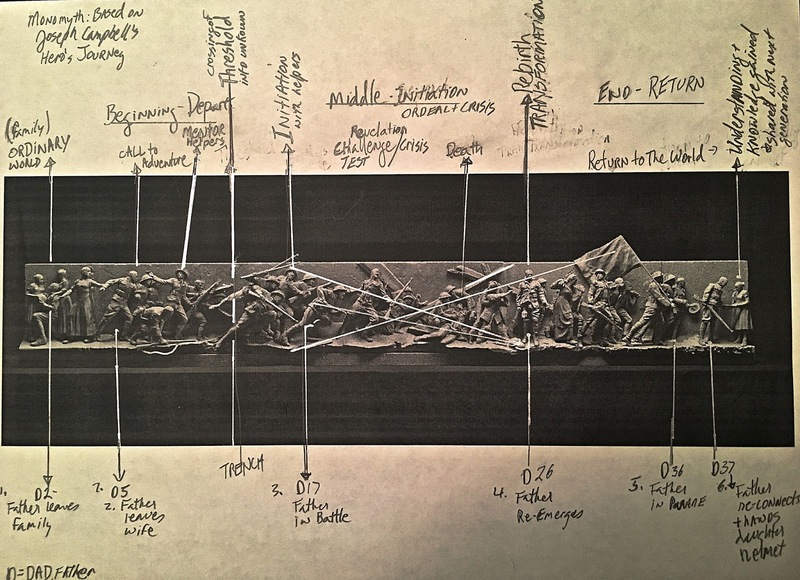 The WW1 relief sculpture is uniquely suited to fit within Pershing Park because it is a multifaceted view of humanity and because it goes beyond the traditional glorification of men in battle. It is a complex story that narrates the full spectrum of human feelings. Clarity in visual narration has been established through simplicity of design and structure. The geometry of the structure is laid out in this way with meticulous purpose. The purpose is to create a universally understood story regardless of age, culture, or society. A Soldier’s Journey is divided into 3 acts; a beginning, a middle, and an end. Each of these sections is equally divided into beginning, middle, and end. Each section of the story thus has a start action, a movement or transition in between, and an end or exit action. The mathematical spacing of the parts is the story and that spacing is critical for the understanding and clarity of the visual narrative. Because each section has opposing feelings and actions at each end, a specific distance is needed to bridge the gap. The transition between the opposing feelings has to be a certain distance in order to create visual clarity in the story. Pacing is critical for clarity in telling this story to the Memorial visitor. The Spacing between these parts is how I have created pacing. For example, you cannot ram a battle scene into a quiet scene; nor can you lurch from a quiet scene into an energetic scene without the proper transition and spacing. Parts need to build into each other and flow with the correct rate of energy and speed to maintain harmony of the whole. Transitions are crucial to all forms of narrative storytelling, whether visual, verbal, or musical. 1. START- The initial scene begins with a group of three which is the nuclear family. The scene is static, stuctured vertically, and quiet in mood. All the family members gaze within the circle. 2. TRANSITION- The middle scene shows the change in mood. The father is pulled forwards by his comrade soldiers, away from his vertical and static-posed wife. There is a building tension in movement as the soldier is pulled away from home. 3. END OF ACTION- The final scene presents guns for the first time. It is the beginning of aggression. The men pick up their guns and thus begins a charged move forward. Three women occupy the left of the scene. This is Venus or love, represented in family. Venus is self-contained and in harmony and balance. Men with rifles ready and aggression in their faces marks the right of the scene. This is Mars, the aggressor of war. The middle scene portrays the transition and tension in a tug of war between home and war. A clear space marks the rest note between speeds and scenes. In act 1: soldiers preparing for war.- In Act 2 soldiers are in the full charge of battle. 1. START- There is a marked crescendo from the previous scene. This leads to full Mars unleashed, which is war. War is humanity out of balance. The men charge forward in an explosion of animal aggression. The kinetic frenzied energy is at a maximum of intensity in gesture and feeling. 2. TRANSITION- There is an empty space or a void where the charge drives vertically down into the ground. The void is the transition between the aggression of war and its inevitable outcome: death. 3. END OF ACTION- The result is the Cost Of War marked by a Pieta scene. From this death, the poses and figures rise to the shell-shocked soldier to the right. He marks the transition to the next chapter. It is a moment of quiet contemplation, in direct opposition to the battle scene at left. The verticality of the shell-shocked soldier stops the flow of action forward. It is the only figure that faces directly out at the viewer, engaging the viewer in a moment of maximum contemplation. The pose acts as a full stop. The traumatized soldier is flanked on each side by nurses and by the epogee of an arc both forward and side to side. The nurse’s heads are turned away from him. There is also additional space around him as a solemn statement of alienation. This is one of the quietest areas of the story. The space allows the figure to breathe in the solitude of the moment. This is the father re-emerged and transformed. 1. START- The scene is marked by soldiers emerging diagonally from behind the shell shocked-soldier.This diaganol continues with the nurse and wounded soldier. They are exiting the war. 2. 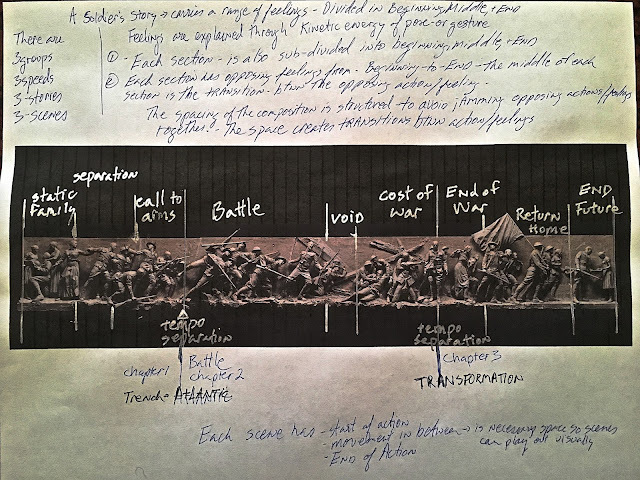 TRANSITION- The middle scene is marked by 2 groups of 3 soldiers. This first group is a connection between the past as a soldier looks back and advances towards the final scene. The first group also connects with the nurse behind them. The second group joins visually with the final scene. The composition is now moving parallel to the viewer in a more solemn and contemplative fashion. The 3 groupings are needed to create the correct speed to exit the war and to explain the gravitas and epic nature of this historical moment; The figures moving in diagonal to the picture plane is active whereas the figures moving parallel to the picture plane is contemplative. The flag is the zenith of the diagonal, rising up from the void in the center of the composition and proceeding forward to the end. This area shows contains many complicated stories and they are all stitched together to flow forward to the end scene. The final scene is the quietest and most solemn moment. It is a full stop. The father hands his daughter the helmet. She looks down into it divining the future. There is weight on the back of the child's head. The composition is designed as a Egyptian hieroglyph were the figures face the viewer in Silhouette. This marks the future generation being handed the next war.